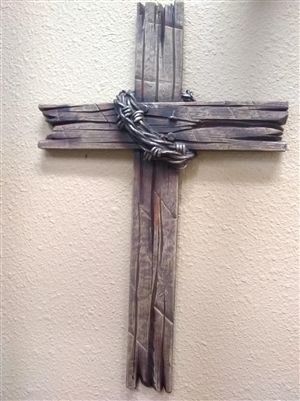 This stunning Brown Faux Wood & Barb Wire Cross Wall Decor to make a strong statement in your home or office. Made of polyresin, this unique cross features a faux wood finish and barbed wire-inspired accents. Hang it independently for a simple touch, or use it as part of a faith-filled gallery wall!